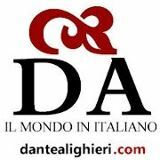 The Italian language, as it is with Spanish and French, uses a formal and an informal “You” verb tense. To be polite, you should always use the more respectful, formal tense of “You” when addressing someone important or a stranger. It shows that you have manners. In English, we don’t have a formal tense of “You” when speaking—everyone is on the same level and, though you may use “Ma’am” or “Sir” when addressing a stranger or someone important, it really isn’t that same thing. For example, in English, you can ask someone, anyone, “How are you today?” Regardless of whether you are meeting the President or your best friend, the question remains the same, “How are you today?” In Italian, when asking someone you don’t know or someone of importance, you would ask, “Come sta oggi?” “Sta” is the formal “You” use of the verb; however, if you were asking your best friend, you would ask, “Come stai oggi?” “Stai” being the informal use of the verb. My biggest dilemma in speaking Italian is knowing when to cross over from the formal “Lei” to the informal “tu.” I have been here three days and when I speak to Franco, Anna or any of the Italians that I have built a friendship with, may I use the informal “tu” or would that still be too rude and assuming of me? Without asking, I have started using the informal with Anna, yet when she responds to me, she uses the formal—I fear I am being gruff and socially slapping her on the back as if I am some rude country bumpkin. Carolina has started to tease Anna and me about our friendship—given the fact that Anna and I have bonded so quickly on a personal level. Carolina keeps teasing Branzino, Anna’s husband, that he needs to be careful because I might steal Anna away from him. Of course, Anna is my mother’s age and Carolina is just being cheeky, in her Scottish way. Branzino smiles and we all laugh about it. He is about 5-feet tall and weighs, at most, 100 pounds when wet, while I am close to 6-feet and have a good 100 pounds on him—though he could probably whip my behind if needed. Still, it speaks to the level of friendship that we have all developed amongst ourselves. So … how long do I have to “Lei” you before I can “tu” you? That, Hamlet, is the question. I was thinking, “I can’t imagine being in America and having to ask someone if I can be informal with them.” It all seems so odd. I treat everyone I meet as if we have been lifelong friends. Hmm, now that I think about it, that may be why I too often put my foot in my mouth early on when getting to know someone. Claudia and Carolina both laughed. Well, I have already started using “tu” with Anna without asking, so I am already rude—I am not going to change midstream now; however I am going to try and charm Anna down to having no other choice but to use “tu” with me. In bocca al lupo, Mark—Good luck, Mark! We were out of the house earlier than usual this morning. We are traveling south to Montalcino to visit the Cantina di Montalcino, DaVinci’s newest cantina where they produce Brunello di Montalcino—a wine made with 100% Sangiovese grapes. 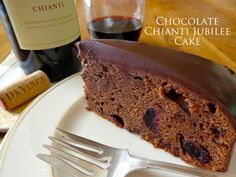 Brunello is really the big brother to Chianti and it truly is one of my favorite red wines to drink. 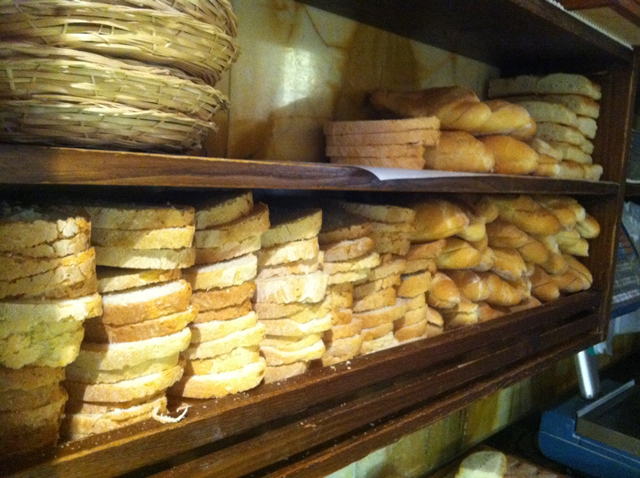 On our way south, we stopped for a late morning snack at a bar just below the walled town of Monteriggioni. This was a typical bar that you would find everywhere in Italy. 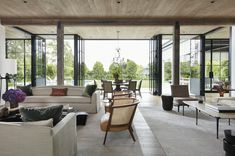 Inside, there is the bar where you may stand and order a caffè, a beer, a cocktail or have a little snack. If you stand at the bar you don’t have to pay the additional table fee to sit down, so standing at the bar to drink and eat is popular in Italy—it is perfect for a quick in and out. Over by the seating tables there was a sandwich counter where all kinds of delicious things were in the meat case and hanging from the ceiling, too! “Un caffè,” – “A coffee,” I said, since it was about 11:00am. “Un caffè con un panino?” Nadia asked, rather loudly. 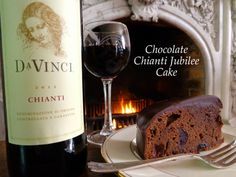 “Naturalmente Chianti. Grazie a Lei,” he said, and he was off to pour my glass of Chianti. Nadia giggled a little behind the counter when I ordered the red. 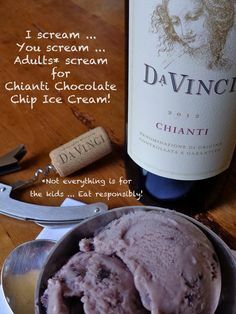 I think I said it with enough gusto that it translated into “Why naturally I’ll have the red, make it Chianti, I was crazy to have ordered coffee!” And with that giggle, I had a new friend. Nadia let me take a couple of photos while she made my sandwich and I was able to “Italian” my way through some small talk. I asked her about the bread, cheeses and various meats hanging above her and in the case. “Che tipo di salume è questa? 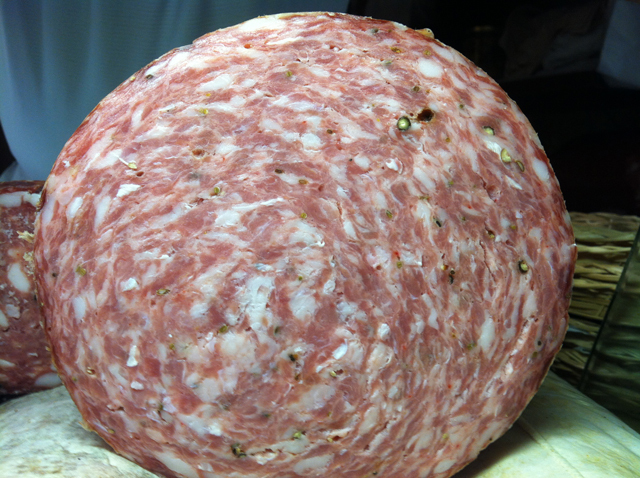 –“What kind of salami is this?” I asked, pointing to the large salami sitting on top of the rest. 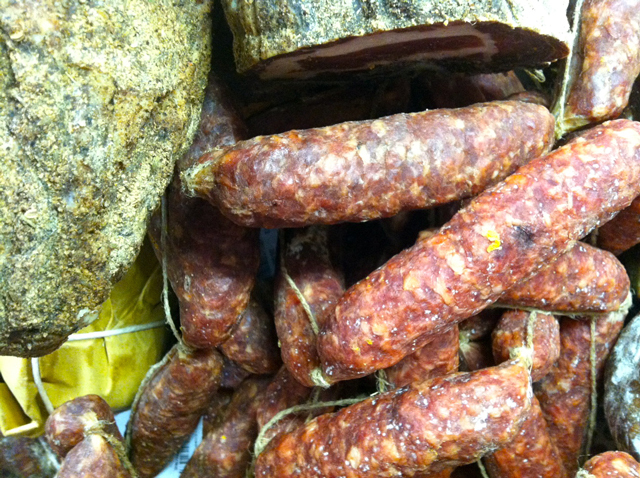 “Finnocchina.” Which means that it was fennel –finnocchio– salami. I had to have a taste. “Posso avere un gusto, per favore? I asked. The other delectable thing behind the counter was porchetta—roasted pig that is seasoned with rosemary, garlic, salt, pepper, extra virgin olive oil, and I don’t doubt some secrets ingredients, too. In a very odd way this is the Italian equivalent to American BBQ, though the moment I say that I am completely incorrect. 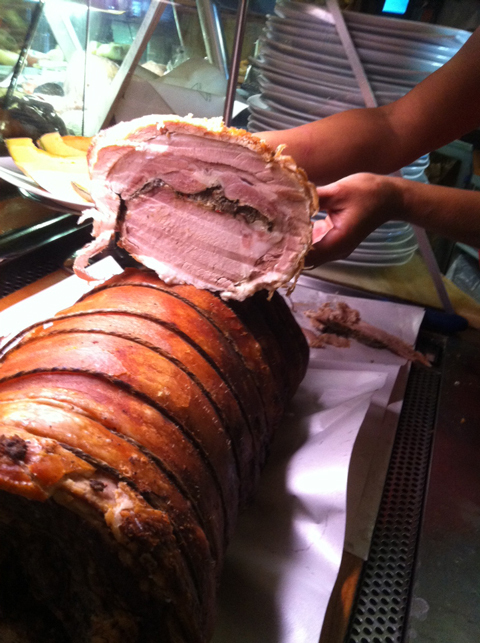 With porchetta, the skin is crunchy, crunchy, crunchy and the meat is flavored by the herbs. Unlike BBQ, this is not spicy nor smoky, but it is oh so good! I laughed and there were many “buongiorno,” “arrivederci,””buona giornata,” between the bartender, Nadia and all of us in our group. 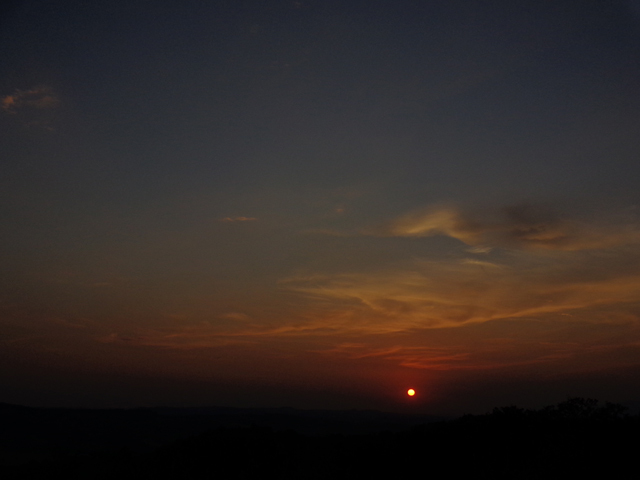 Less than a mile up the hill was Monteriggioni, a town made famous in Dante’s Inferno. Wonderfully preserved and ringed by a high stone wall with remnants of the wall’s towers (14 in all) that Dante referred to in his book, Monteriggioni is a must see stop if you are near and NW of Siena. As we drove farther south, we passed field after field of sunflowers with all of their heads down—their growing season was over. 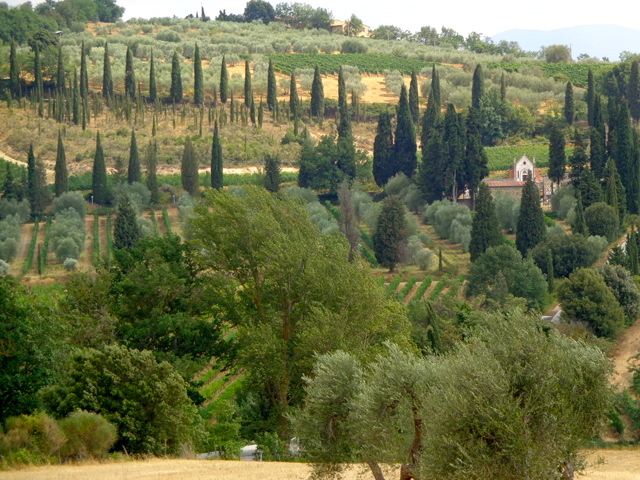 Italy had been hot and dry this summer, so we have missed seeing Tuscany in all of its “sunny” glory. Sunflowers in Italy are used to make sunflower oil, which Italians use mostly for frying as we would use corn or vegetable oil. It gives a mild, nutty flavor to fried food—perfect for arancini, fiori di zucchine fritti, zeppole, and the list goes on. 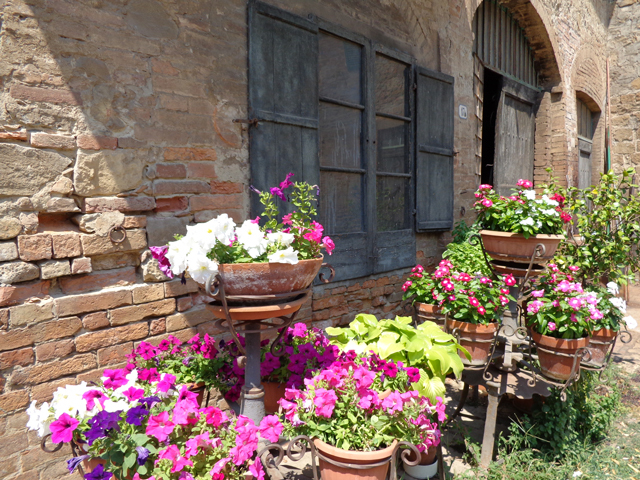 This was my first time in Tuscany in the summer. Previously I had been here in September and October, so I was really looking forward to seeing the rolling Tuscan hills covered in sunflowers. Oh well, a good excuse to come back again in late May or June! On a whim, Carolina had our driver Filippo (not Filippo Volpi, from the Cantine, but a different Filippo) stop in the town of Buonconvento for a brief moment. It gave us a moment to stretch our legs and take some photos. 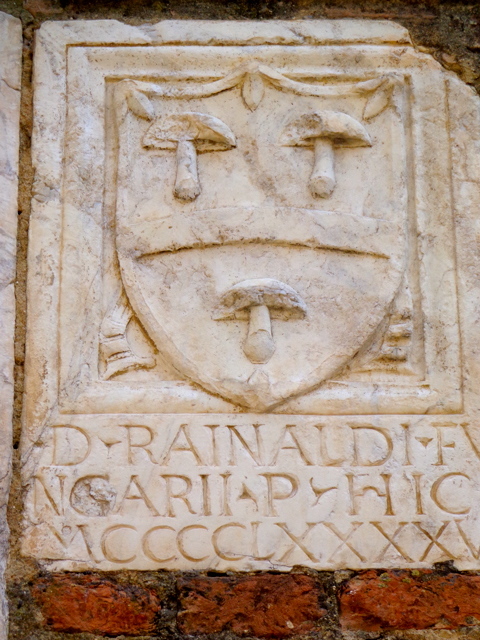 Rounding a corner, we came upon city hall, with its ancient crests embedded in the walls. 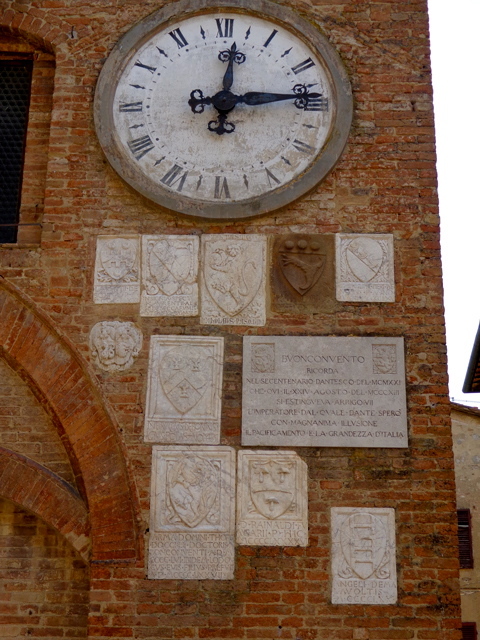 You will see this type of thing all over Italy—municipal buildings with antique plaques displaying important, powerful and wealthy families’ crests. 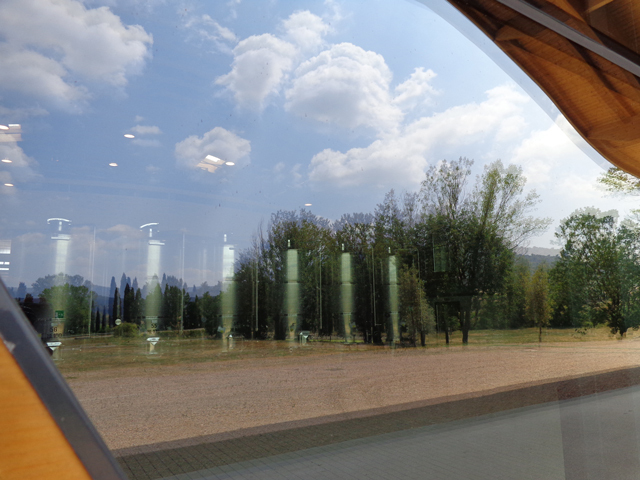 Back in the car, it wasn’t long before we arrived at our destination—the Cantina di Montalcino, a very new and modern structure just outside of Montalcino. 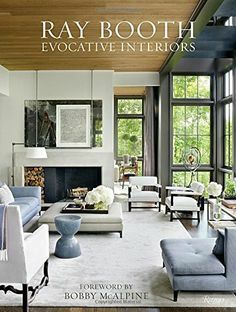 The design of the building has been controversial for some, but I think it is a beautiful structure that mirrors the rolling landscape that surrounds it. Also, the large circular, glass oculus becomes intriguingly reflective the closer you get to it. The almost haunting spirits of both inside and outside fool the eye—are the distilling tanks out in the field amongst the trees or has the winemaking process captured the very essence of nature inside? Inside, Silvia and Agnese, our hosts, had prepared a Brunello di Montalcino wine tasting, which began with a tour of the facility, including the first taste of the Brunello 2008 down in the cellar. 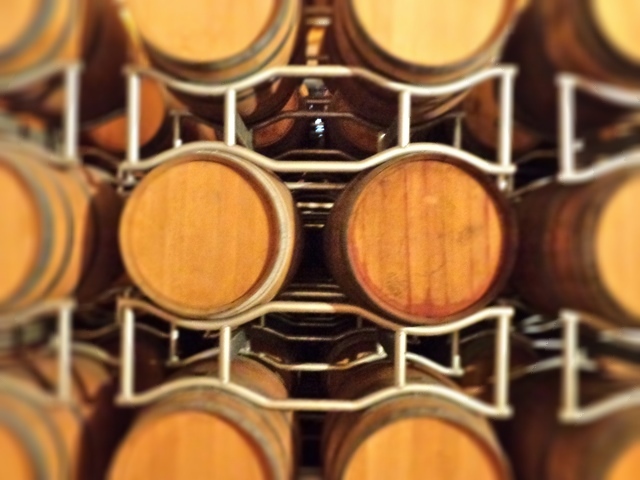 Drawn from the large oak barrels, we could taste a Brunello still in the making. It cannot be released into the market until 5 years after its harvest date (2013), so what we tasted was a young Brunello, with a more present wood or forest taste and still in need of some depth of flavor, complexity and balance. Those come with age and age comes with time in the barrel. Barrels are key to the aging of wine and, over the centuries, as people succeeded and failed in making wine, the natural evolution of winemaking moved from lucky happenstance to perfected science. Again, you must always remember that wine is a live, interactive thing. There is variance in the flavor of the grapes and variance in the flavor of the barrel. “Wait, a barrel has flavor?” you ask. Yes! The inside of the barrels are toasted, slightly charred, if you will. The toasting of the wood is what produces the flavors of vanilla, smoke, caramel, tobacco, butterscotch, and a range of spices, to name a few. Also, there is variance in how much the inside of the barrels get toasted or charred, so the oak barrel is a key flavor component. How the fermenting grape interacts with the toasted oak inside the barrel or barrique (the name refers to the size of a specific barrel) adds an improvisational spin to the winemaking process. Upstairs we tasted vintages 2007, 2006, 2004 and re-tasted our 2008 last. My opinion: 2006 was exceptional; however, remember that we all have different palates and preferences. Of the nine of us at the table, about half preferred the 2004 over the 2006. And this does not mean that the 2007, which is going to be released soon, was shabby. It wasn’t, it was very good, but the great thing about attending a tasting is that you get a chance to taste several years or vintages. A tasting provides you the opportunity to see how the wine—this living thing in the bottle—is reacting with you on a particular day—when you are being influenced by the food you are eating, the aromas of the room you are in, and even by the sociability of the people around you. 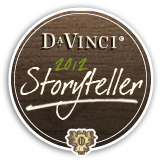 Would I hesitate to buy DaVinci’s 2007 Brunello di Montalcino? Not for a moment, but if it was next to the 2006, then the 2006 is going home with me first. And the 2004? I’d buy it in a heartbeat right along with the 2007. But my preference for the 2006 touches on why wine collectors purchase cases of a particular vintage. If I really enjoyed the 2006 when it was only six years old, think how much more I will enjoy it when it is 10 years old?! 1. It is the type of wine that, by law, cannot be sold before it is 5 years old (5 years after the harvest date, which is the vintage year listed on the bottle). 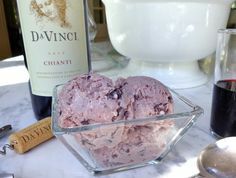 It has to be made with Sangiovese grapes grown in the Montalcino area. 2. It is a wine that should be opened and allowed to breath for about an hour before you are going to drink it. If you don’t have a decanter, not to worry, let the wine breath in the uncorked bottle or, better yet, pour the wine into your glass and allow the wine to breath or “decant” in the glass. 3. 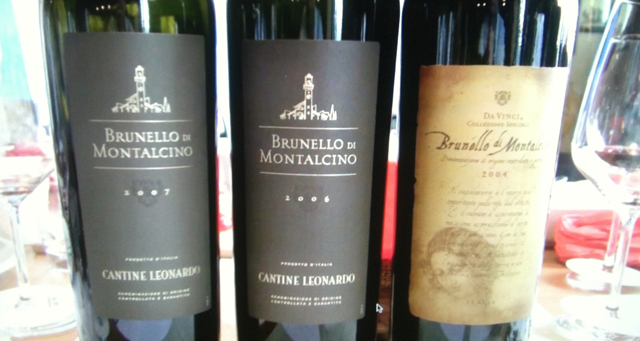 You should look for a Brunello to be at its height of flavor around 10 years after the vintage date. Now, don’t get too hung up on this fact. We are talking degrees of flavor and of taste. Remember, I really enjoyed the 2006, it is only six years old at this point, so if I were to think “Oh, this isn’t 10 years old yet” I would be missing out on a great vintage for the next four years while I waited for its 10th birthday. Think of each vintage year as one of your children. They each have a different personality, but do you love and enjoy them any less? And the best part about going to a wine tasting, in addition to the wine, is the food. 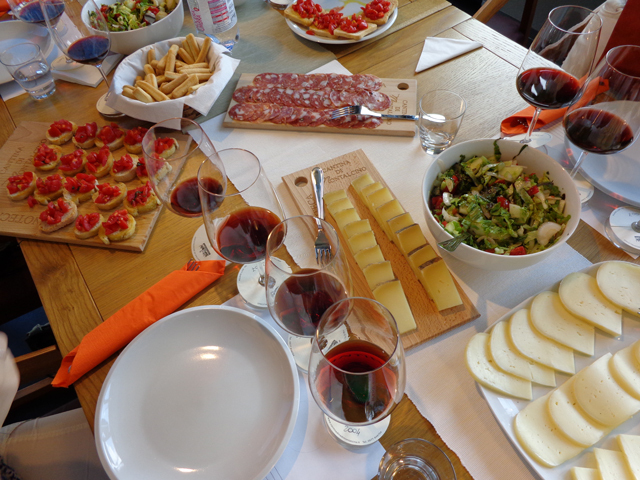 After our tasting, we ate lunch at the Cantina and, again, no one does a light lunch of cheeses, meats and appetizers better than the Italians. 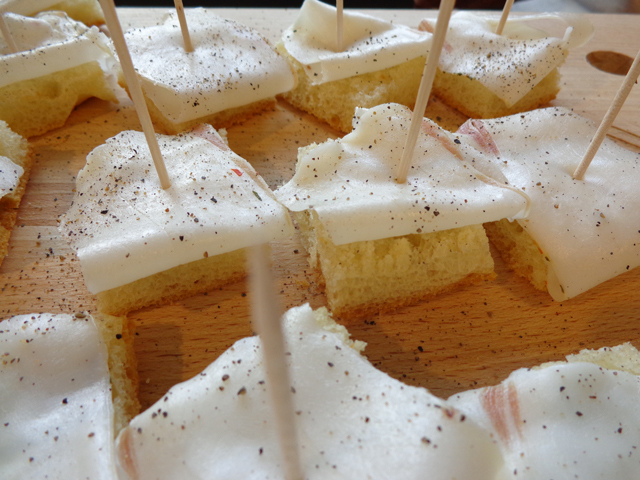 One of favorites that will make some of you flinch at the idea, though if you were to taste it I think it could convert you, is lardo. Yes, lard. Thinly sliced, peppered, and placed on top of a piece of bread, think of it as butter. I have a friend who adores lardo and she calls it “meat butter.” Hmm, I am not sure if that sounds more appetizing or not, but lardo is glorious and no one prepares it better than the Italians. Cheese is a great complement to wine and I am not sure that I know of one cheese that does not pair well with wine. 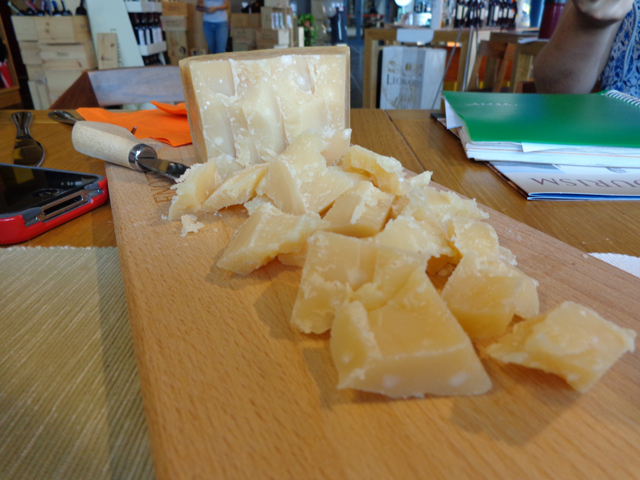 I was excited to see one of my favorites on the table—chunks of Parmigiano-Reggiano. 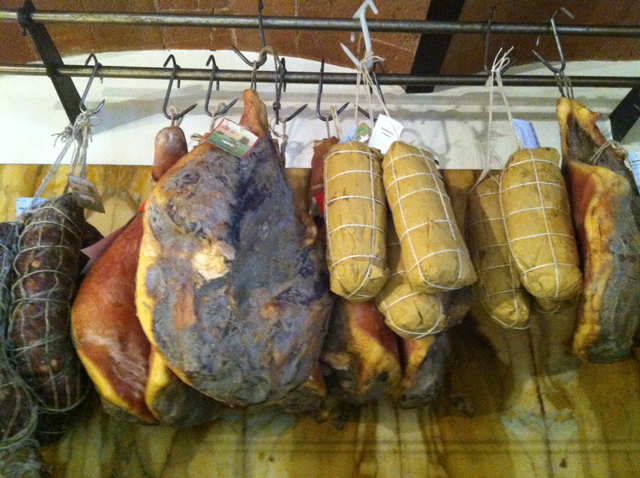 Made in Parma, it has just as many laws governing its creation as Brunello does and that is one of the reasons it is so particular and fantastic. A little pricy, but worth every dollar per salty, nutty ounce. Freshly grated over pasta, it will run rings around the “shaky” cheese that haunts a shelf in most American refrigerator doors and, when wrapped in plastic wrap or placed in a re-sealable plastic bag, this king of Italian cheese will last a very long time in your refrigerator’s lunch meat or produce bin. It may not look like a filling lunch, but it was. 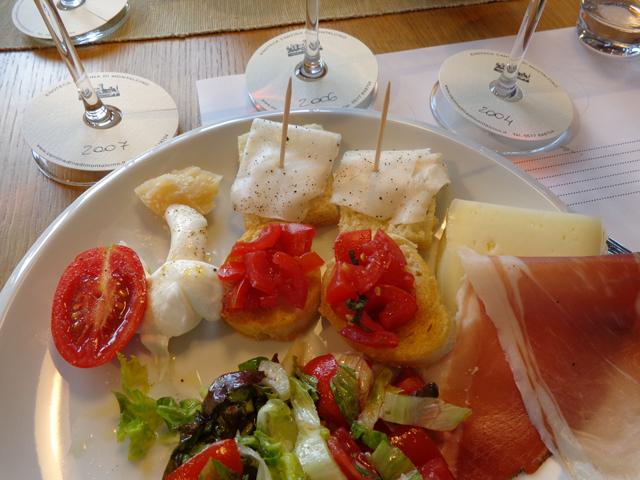 Remember, in Italy, wine is a food, too, so I had a “helping” of the 2007, 2006 and 2004 on my “plate,” as well. 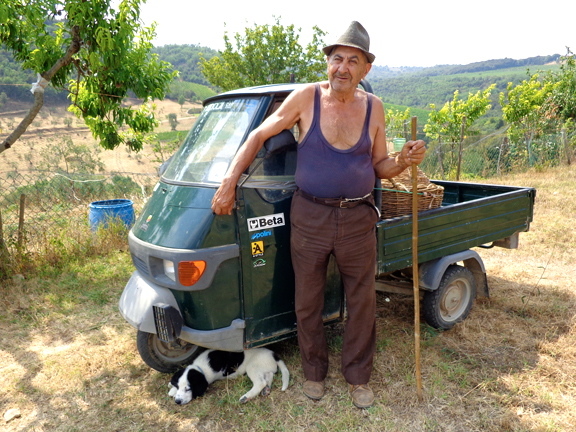 As we had done in Vinci after the Chianti tasting, we headed off to meet one of the growers. Filippo was taking us just south of Montalcino, right next to the famous Sant’Antimo Abbey. 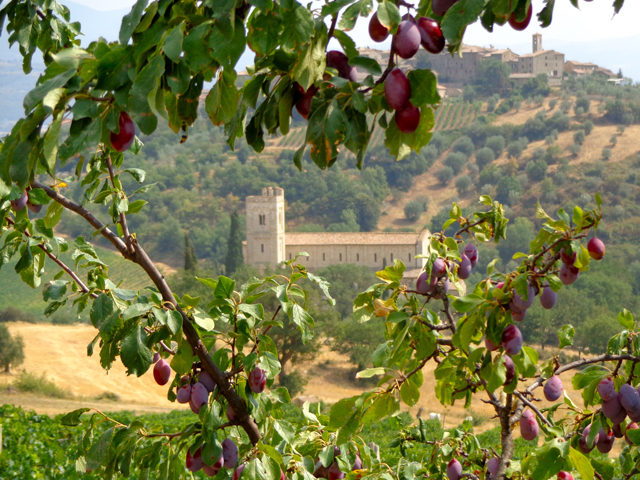 I have been to this glorious abbey twice before on previous trips to Italy, but what was really thrilling for me was to meet the gentlemen who grow grapes in the shadow of the abbey. 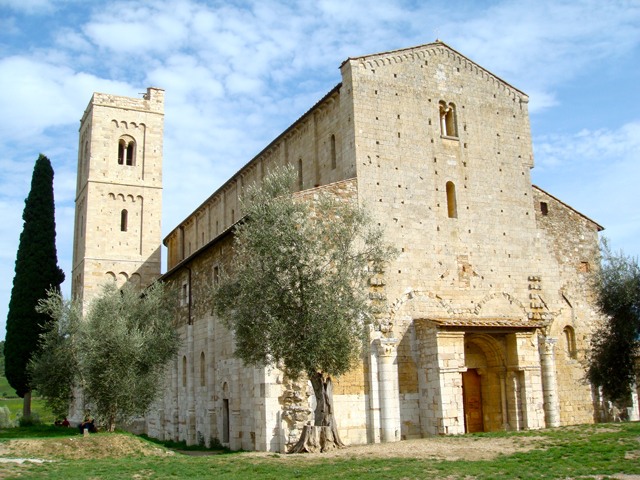 This is classic tour guide Italy, meaning I know of few Italian guidebooks that don’t feature an image of the abbey or of the surrounding countryside. 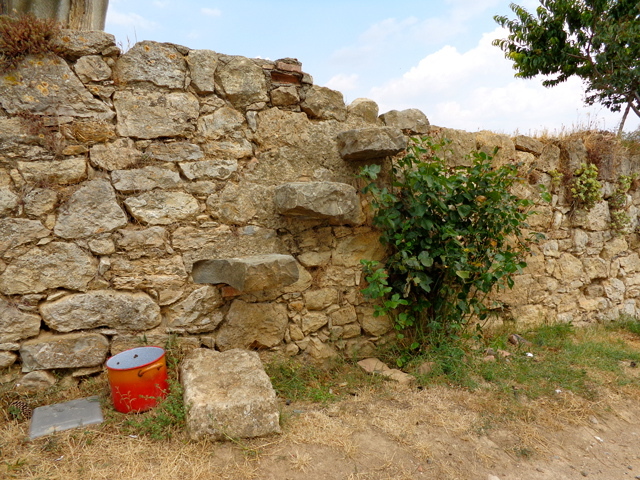 It is breathtakingly beautiful –bellissima– and yet, so very rural. Maybe that what attracts people to this place—simple beauty, color and pattern, captured in its landscape. Filippo parked near the abbey and from here we walked the gravel road that split a vineyard to make our way up the hillside to the grower’s home. Here the land is rustic, though I hate the fact that “rustic” has been so overused that it no longer has the same affect on us. 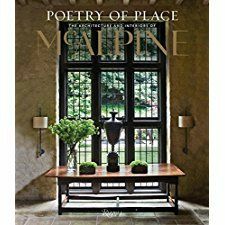 When I say “rustic” I mean that things are used here—the land is plowed, the gravel road is worn and dusty, time distresses the abbey’s marble to a warm and glowing patina. 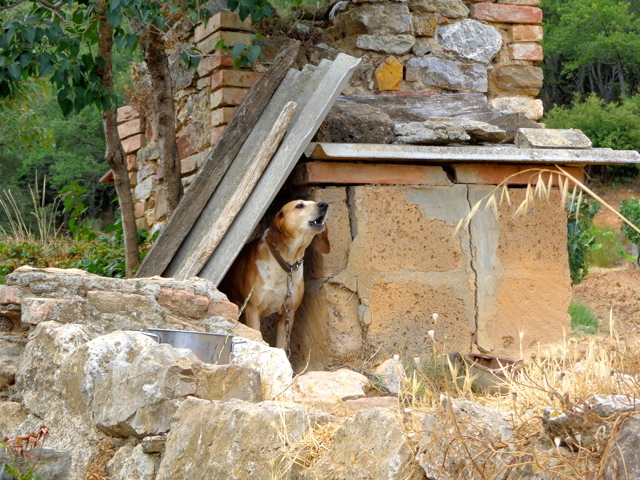 And the people are rustic, too. Their beauty lies in their weathered and worn hands, leathered and windswept faces that show of a life lived in the elements. 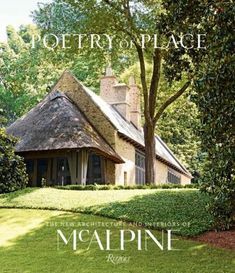 If you are looking for pristine, preserved, refined and elegant beauty, then you have come to the wrong place; however, if authentic life and natural beauty inspire you—here is your muse! We met with Artibano and Allerno “Uncle” Menchini. Artibano could have been an American cowboy—lean, with a chiseled face, tanned by the sun. He looked like a farmer, but a farmer that should have been on horseback, rounding up cattle before branding them. 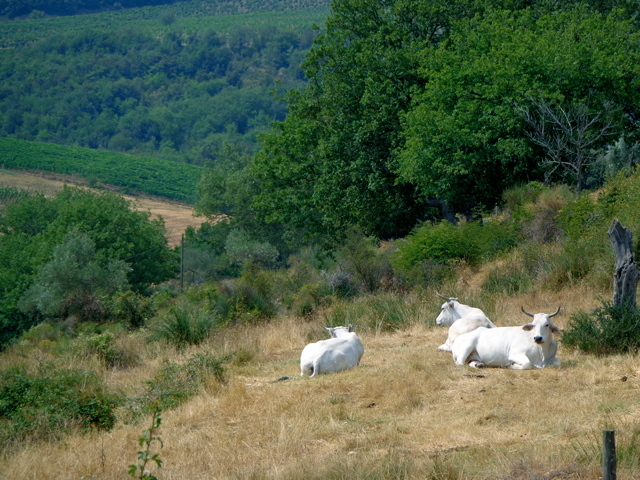 Here within eyeshot of Sant’Antimo, Artibano wrestles vines and brands his “livestock” with a label on a bottle. Allerno or “Zio,” his nickname, is a whole other story. A man who is his own master. A man, who, upon meeting him, will tell you “I’m ready to be in as many photos as you wish. Let me know.” Yes, Zio –Uncle– is always ready for his close-up and has graced the pages of many an international wine magazine. Leonardo may have had his Mona Lisa, but here, DaVinci has its Zio! Once again, I am reminded of how much life goes into a bottle of wine. 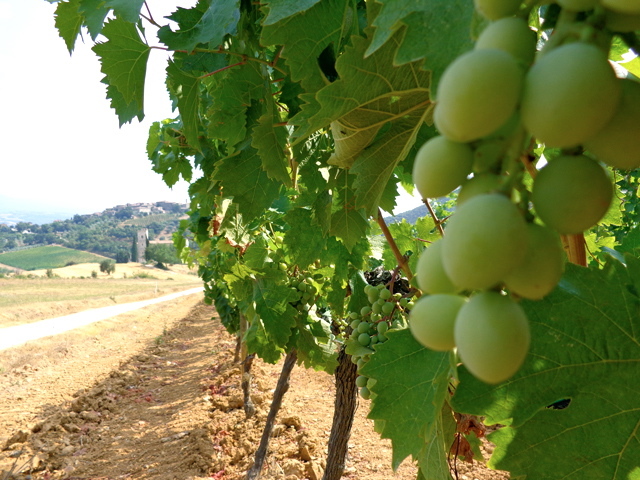 At every step along the the path from a new vine planted in the soil to the liquid that excites your taste buds when you drink it, wine is a living interaction between people and nature. I took my time walking back to the abbey. 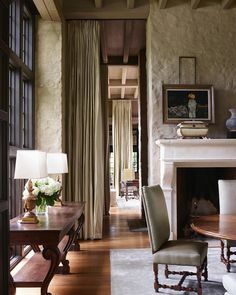 There are places that you visit in your life that make an impression on you, places where you want to savor the experience of being there and commit them to memory. Burn it into your psyche long and deep enough so when you feel the sun hit your face a particular way regardless of where you are at that moment, you will be instantly transported back to a very specific place and time in your life. I feel this way a lot about Italy in general, but Sant’Antimo, especially from this vantage, is now locked in my soul to savor again and again. 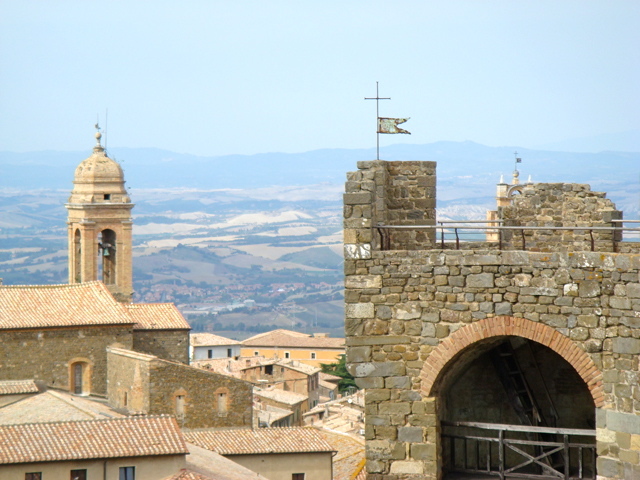 The town of Montalcino is a hub for wine in Italy. It is a little village with a rich history of wine. 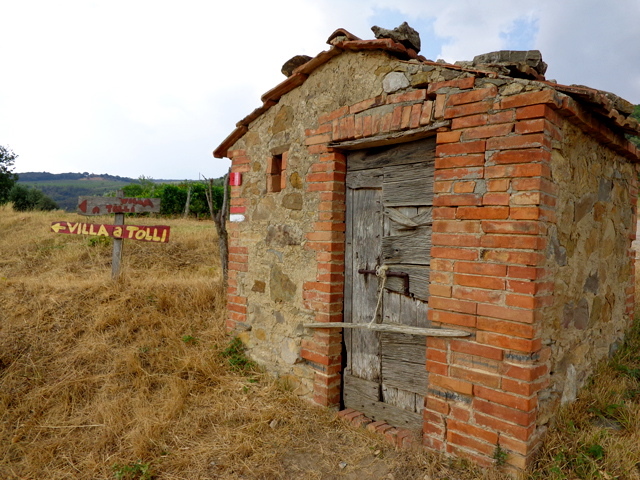 In a way, it seems to be the “Napa” of Tuscany. 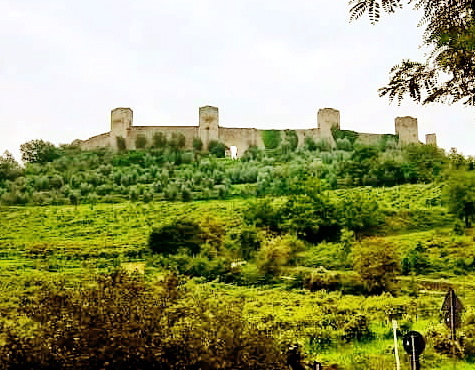 I know people with argue about other places in Tuscany that are as important as Montalcino, but there is definitely something very special and particular about this town when it comes to wine. 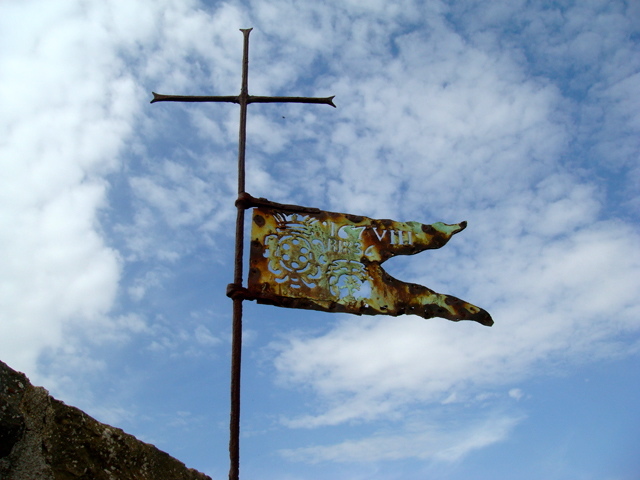 A climb to the top of the Montalcino’s fortress will afford you a 360-degree view of Tuscany. Walk along it’s fortified walls and you might imagine yourself on guard, looking out for an approaching army or maybe Hamlet’s father’s ghost. I paid for my gelato and as I approached an empty table nearby, both games stopped, mid-action, and everyone turned around to face me. Suddenly I was in a Wild West movie—the carpetbagger from out East, who just ordered a glass of milk at the bar. I stopped dead in my tracks when they all turned around in unison, the air full of tension. A couple of the guys nodded their heads and both tables turned back around and began playing again. I believe I heard a honky-tonk piano player start back up with “Camptown Races” as the bar’s Madam approached me to say, “You aren’t from around these parts, are ya, Mister?” But, now I may be imagining an episode of Gunsmoke. Filippo had stepped out for a moment and returned just after my face off with the pensioners. 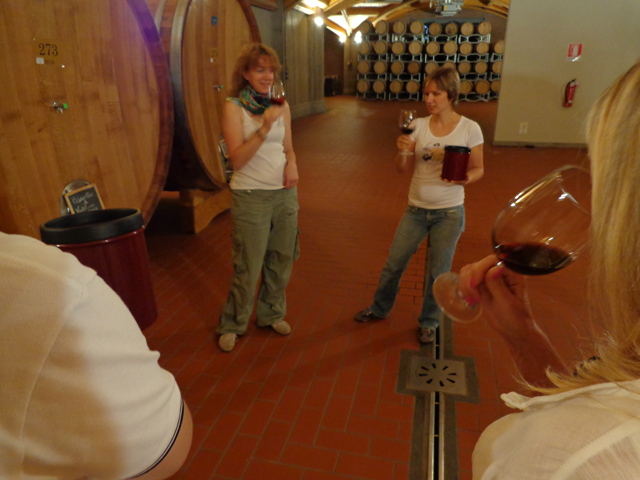 The ladies had gone into the wine shop inside the fortress and happened to meet the chef of the restaurant. They shared a glass of wine as the chef gave Cathi some of his favorite classic Tuscan recipes. I wished I had been there too, though I did get my own recipe—a recipe for disaster—back there at the bar. 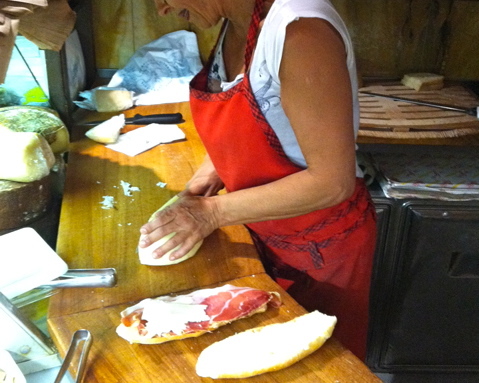 Carolina is wonderful about being as excited to show off Italy to us as we were in having her do it. 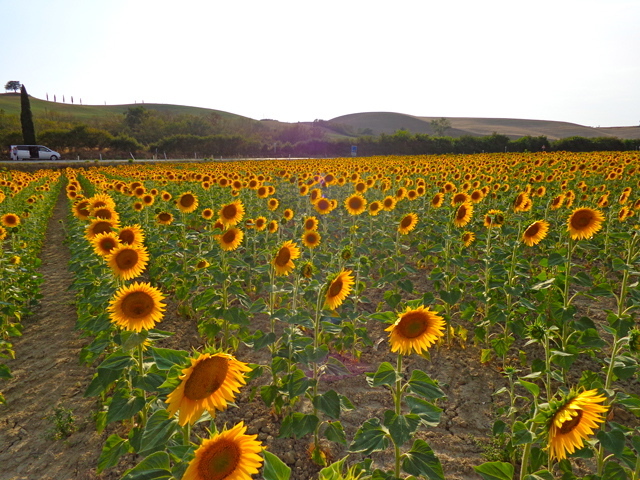 Filippo backtracked a little bit and we arrived at, what seemed to me, to be the last field of sunflowers in Tuscany with theirs heads still up. Girasole (pronounced “gee-RRRAH-so-lay”) is the Italian word for “sunflower” and it is a wonderful word because it is a combination of two Italian words. 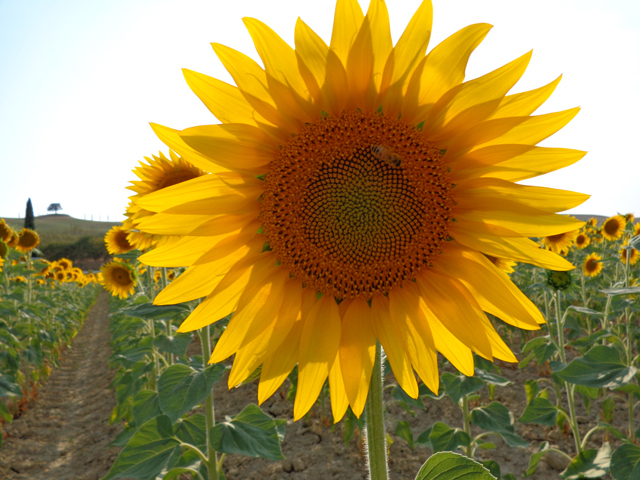 Gira means “turns” or “rotates” and sole is the word for “sun.” Since sunflowers turn their heads to face the sun, it seems logical that girasole — turning sun — should be their quite literal and beautiful name. Our day ended with a wonderful dinner at a hillside ristorante, where we watched the sun set, ate delicious food, drank more DaVinci wine, and definitely crossed over from the formal Lei to the informal tu. Salt and freshly ground black pepper to season the chicken. Dry the chicken pieces with paper towels to remove any excess moisture and liberally season with salt and pepper on both sides. Heat the oil in a large skillet on medium heat, and when the oil is hot, add the chicken pieces, skin side down and fry until nicely browned, turning to brown both sides, 3 to 5 minutes on each side. When the chicken has browned, transfer to a plate and set aside. Add the white wine and garlic to the pan, scraping the brown bits off the bottom of the pan. After the wine has reduced by half, about 3 minutes, add the strained tomatoes, olives, salt and pepper. Stir until combined. Return the chicken to the skillet with its juices. Cover, turn the heat down to low and simmer for 20 minutes. Remove the cover and cook another 10 minutes, until the chicken is done and the sauce has thickened slightly. Remove the chicken to a warmed platter. 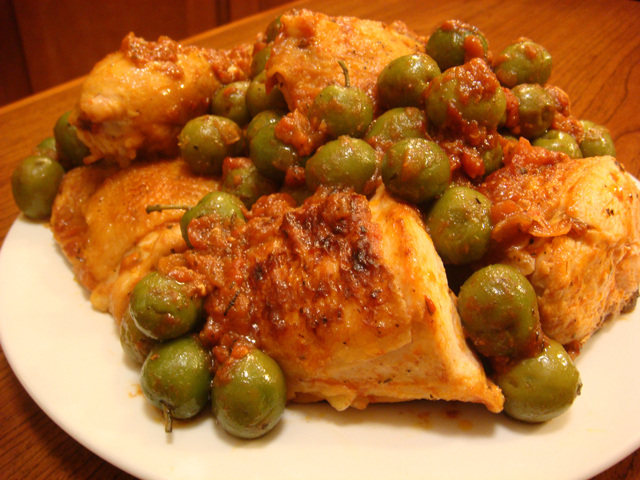 Adjust the seasoning of the sauce with salt and pepper, and pour the sauce and olives over the chicken. Serve hot. *Note: Strained tomatoes can be readily found in most supermarkets in either the canned tomato or pasta aisles. Sometimes the product may be referred to by its Italian name “passato” and can be found either bottled or cartoned.